Well, the lemon chilli chicken part of this is really pretty straightforward. 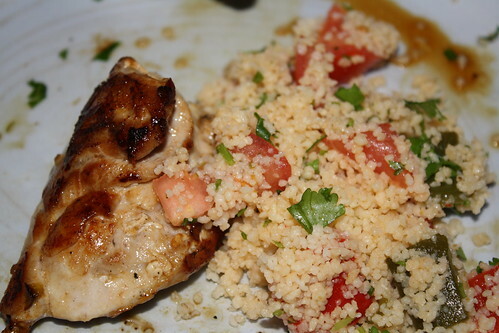 What is interesting is the couscous salad. At the risk of sounding like a broken record – I’m quite into salads and during summer we eat quite a lot of couscous. But mixing through the same lot of vegetables can get a little uninspiring. This recipe comes from Gordon Ramsay’s Makes It Easy . It’s actually the first thing I’ve cooked from this book. Some of the recipes seem somewhat uninspired (roast pork sandwich? really?) but this recipe proves that there’s at least one gem. The lemon and chilli chicken part is facile. The recipe is for chicken wings on the BBQ. I opted for chicken thighs, pan fried (and boy, did that end up with chicken and fat spitting all over the kitchen …). Simply take your favourite cut of chicken and marinate in olive oil, lemon juice and finely sliced chilli for a couple of hours. Cook in your favourite way. For enough couscous for two, with a little left over, you need to start by roasting a red and a green capsicum and a few cloves of garlic. Heat the oven to 200°C fan and toss the capsicums and unpeeled garlic cloves with a little olive oil. Place the vegetables on baking tray and cook, turning the capsicums every now and then, for about 20 minutes. The skin will start to blister and you want it blistered all over the capsicums so you can peel them easily. While the capsicums are cooking, measure out 100g of couscous into your serving bowl and add 100mL of boiling water. Stir the water through with a fork and then cover the couscous for about 15 minutes, fluffing up the couscous every now and then. When the capsicums are done, allow them to cool then peel, remove the seeds and chop coarsely. Add to the couscous. Squeeze the roasted garlic in too: cut the blunt end off the cloves and just squeeze out the centre. Mix through ½ tsp of ground cumin and a good squeeze of lemon juice and a generous glug or two of extra virgin olive oil (use the cheaper light olive oil for the marinade, but don’t skimp here!). Finish with a roughly chopped a tomato (or use cherry tomatoes, for a prettier look) and a big handful of chopped coriander.